This is believed to be the only Hero steam turbine on the market. Designed and built to very high engineering standards in the UK, this turbine can reach speeds of 2500rpm. 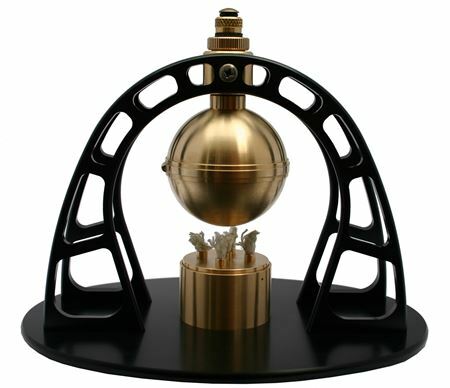 Its design is based on the original first steam turbine invented by Hero of Alexander around 2000 years ago but with some modern improvements. It now has ball race bearings, steam safety valve and a water retainer that almost completely stops water spitting out (the original sprayed hot water). It has a wonderful design that would not be out of place on many mantle pieces. Makes a wonderful didactic presentation. To start the turbine you need to remove the safety valve at the very top of the turbine and syringe in about 12ml of water using the supplied syringe. You then fill the burner with methylated spirit and screw the safety valve back on. You then just simply need to then light burner. Suitable for children 14 and above. There turbines are also known as aeolipiles, aeolipyles or sometimes eolipiles.